Although I am well aware of the concerns and dangers of participating in web based social media sites with students, social media platforms such as Edmodo.com and Ning.com are quickly becoming powerful classroom tools. I am excited about these web based social media platforms and the potential they have for engaging students with curriculum and providing them with 21st century literacy skills. Over the summer months, I looked into ways social media has been used safely to build community and collaboration in business and education. Now that I am a parent myself, more than ever, I appreciate the importance of home and school communication. I thought that I might try a social media platform to support my connection and foster relationships with families. 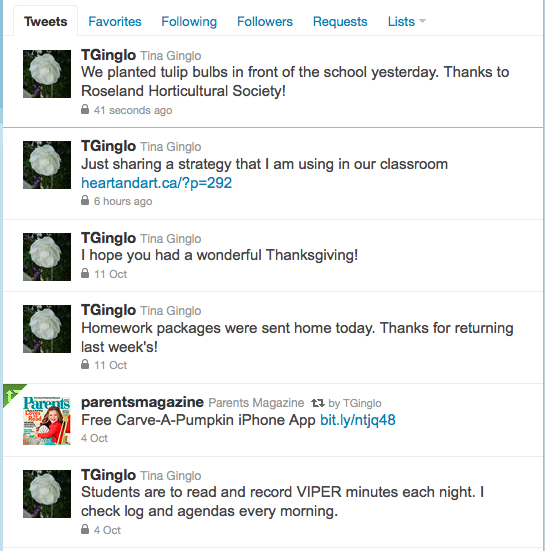 With my principal’s permission, I am now Tweeting to my students’ families! My principal had a few concerns about Internet safety, which I respectfully considered when setting up this Twitter account. First, I have set my Twitter account so I must approve my followers. Since I have most of my parents’ email addresses, it is easy for me to identify whether or not a request to follow is coming from one of my families. Secondly, I set it so that followers cannot comment on my Tweets. Unfortunately, this limits the potential this social media tool has for building community, but hopefully it will help keep parents in the loop and help me to establish trust and rapport with my families. Finally, I don’t identify my school, my teaching assignment or students’ names in my tweets. I have 18 students in my class. To date, I only have two followers, but hey, that’s okay. I have two parents who I touch base with on an almost daily basis about things such as homework reminders and positive events that took place during the day. It will be interesting to see if more parents begin to follow as the year progresses. To learn more about ETFO’s Advice to Members re: Social Media, please click here.